Posted on Mon, Mar 26, 2012 : 3 p.m.
Alright, let's get the obvious statement out of the way right from the beginning: this sandwich has no — and I do mean NO — redeeming nutritional value. There's no arguing that peanut butter provides protein. There's no rationalizing that apricots provide vitamins A and C. There's fat, there's sugar, there's salt... and lots of each. Oy! This sandwich is nothing but giddy, gleeful, obscene decadence! I created this seductive little tidbit for Project PB&J — a contest for food bloggers that is being hosted by my friend Cindy (a former Ann Arborite, I must point out) of Once Upon a Loaf and her friend Christina of She Runs, She Eats. The competition is in honor of National Peanut Butter and Jelly Day, as well as Cindy's birthday, on April 2. What great excuses for a party, celebrating with everybody's favorite flavor combination! The rules required preparing a sandwich and/or a baked good with a nut butter and a jelly/jam or fruit... the critical ingredients in a PB&J, but with some room for variations on the theme. I tried to think globally, since peanuts are an integral part of African cooking. I tried to think of ways to modify classic desserts, such as the Austrian Sachertorte made with dense chocolate cake and apricot jam. And then I came back to the sandwich's inherent identity; it just made sense to not riff into territory that was too terribly unfamiliar. A PB&J is classic after all; at what point, I debated philosophically, does it cease being a PB&J if one tinkers too much ...? And so, I kept to the basics. I used peanut butter. I used jelly. I tossed a bit of Nutella into the mix because, frankly, one can rarely go wrong with Nutella; its chocolate and hazelnut flavors are both nice complements to the other two ingredients. And then, the hedonism really kicked in. What kind of bread to use? Well, why use bread at all? Jeremy loves Luther Burgers, named in honor of the late Luther Vandross, which use Krispy Kreme doughnuts as buns. So, why not use a doughnut as bread? And then — simply because it's been all the rage, and its saltiness and crispness would add flavor and texture to my concoction — I tossed in a little bit of bacon. I'm smirking as I contemplate this notion, even though I know I should hang my head in shame. This sandwich is ridiculously easy to make, which only enhances its beauty. Cook up some bacon. Schmear doughnut halves with yummy things. Put it all together. Grab some napkins. Enjoy! Place the tops and bottoms of the doughnuts onto a countertop. Schmear each top with some of the peanut butter, dividing it evenly among the doughnuts. Schmear the bottoms with Nutella, then schmear the apricot spread over the peanut butter. Place the bacon onto the Nutella-covered portions, dividing it evenly among the doughnuts. Put the tops and bottoms together to form 4 sandwiches. Makes 4 sandwiches, serving 4-8 depending upon how much tolerance you have for such excess. Tue, Mar 27, 2012 : 11:18 p.m.
Tue, Mar 27, 2012 : 4:04 p.m.
Wow! That's pure decadence all right. I would take my bacon on the side, though, unless it was absolutely crumbly. Tearing bacon with my teeth while holding onto something fragile (KK donut) and gloopy (everything else) is my recipe for a big mess. :^) Good luck in the competition. It's hard to top Jif and jelly on pillow-soft bread washed down with ice-cold milk. Tue, Mar 27, 2012 : 11:11 p.m.
We all have such fond memories of that priceless treat, don't we??? Thanks so much for the good wishes! Mon, Mar 26, 2012 : 9:26 p.m.
Oh, yes, indeedy, you'd have to sleep it off; but oh, you'd enjoy yourself so ...! Mon, Mar 26, 2012 : 9:24 p.m.
Tue, Mar 27, 2012 : 3:24 a.m. carbs?, but I thought we were going for no redeeming nutrional value?! Tue, Mar 27, 2012 : 12:23 a.m.
Mon, Mar 26, 2012 : 9:23 p.m. I'd be willing to try it, but I doubt I would finish the whole thing even if i did like it. Personally, I'd rather have PBJ made with creamy Jiff, grandma's homemade grape jelly on some Holsum or Wonder white bread with Doritos in the middle. Mon, Mar 26, 2012 : 8:22 p.m. The best part of this article is all the hand-wringing it's provoked. Yes, Oxyclean, it requires some semblance of a recipe to indicate suggested proportions, the appropriate ingredients, etc. It's not a complicated recipe, but .... And I, too, find the hand-wringing entertaining, Seldon - I made a silly sandwich for a friend's contest, with college-aged males in mind (since I happen to be the mother of one), and look what it's led to! Food fights, philosophical debates, insults, compliments, and all manner of discussion! Mon, Mar 26, 2012 : 8:50 p.m.
No hand-wringing here. It just looks nasty. And does this really require a &quot;recipe&quot;? Mon, Mar 26, 2012 : 7:48 p.m. I usually love Mary's food discussions, but this one is an outlier. It certainly hits the sweet-salty-fatty-umami control buttons but apart from looking and sounding disgusting, it is simply the wrong training for the palate. I think that in general we need to cultivate a taste for food that emphasizes an appreciation for the basic qualities of foodstuffs, rather than overloading the taste like this. Of course, I'm probably not qualified to judge since I don't like donuts. My impromptu entry: an English tea sandwich made with a thin layer of peanut butter (or maybe another one like almond butter) and superthin slices of crisp apple. No, I'm not in the food police. Tue, Mar 27, 2012 : 1:32 a.m. I love peanut butter sandwiches, I love cucumber sandwiches, I make a lovely summer noodle salad with cucumbers and a peanut dressing ... it could work, 'cause I know you've got good instincts. Maybe it's not so much apples/bread but the crunch/crisp of the apple rather than the squishy factor ... hmmm. Maybe it's more about texture??? I do prefer creamy to crunchy peanut butter, so I think you've hit on something, Vivienne! Tue, Mar 27, 2012 : 1:02 a.m. Yes, Mary, I know your food instincts are almost always in the &quot;correct&quot; place. I almost suggested cucumber and peanut butter sandwiches, which I think I would like better. (Cucumber is a fruit, after all.) But I was afraid it was too far outside the parameters. Maybe something squishier. Tue, Mar 27, 2012 : 12:19 a.m.
Hi, Vivienne - I was served lovely tea &quot;sandwiches&quot; by a friend recently on whole grain crackers, with thin layers of peanut butter and orange marmalade, my personal favorite. I've had peanut butter and apple sandwiches before,but they're not quite to my taste; perhaps it's the sandwich aspect, though, because I love peanut butter schmeared on apples alone, but the apples and bread are not a match made in heaven. I'm disappointed that you would say that this looks disgusting, rather than merely taking a pass on it while offering very wise advice about cultivating taste. I'm a fresh, seasonal, fruit/vegetable, whole grain kinda girl, but also see no reason not to have fun. 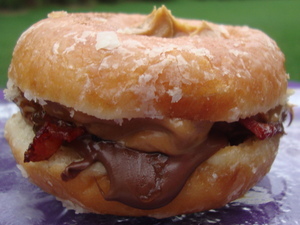 This doughnut sandwich appealed highly to my 21-year-old son's mindset, though! Mon, Mar 26, 2012 : 9:19 p.m. I'm not saying what other people should eat, just expressing a viewpoint. There is a great deal of discussion about why we are as a nation obese and diseased because of diet. My own approach is moderation and selection of good fresh authentic food wherever possible. I'm not interested in dictating to others, just carrying on the conversation. If you're talking about training other people's palates, you're in the food police. If you're talking about training your own, you aren't. Mon, Mar 26, 2012 : 6:23 p.m. Many of Mary's creations seem wonderful to me, but this seems too over-the-top sweet &amp; rich for me. I don't think the bacon saves it for me. However, this did get me thinking... how would I change this? Maybe it's the doughnut that makes me cringe the most, so how about something dry and non-sugary like water crackers? Apricots also aren't my favorite. Maybe a date spread instead? I've seen recipes for date spread that include carob powder... maybe a date spread with Nutella (or maybe just some cocoa powder)? Put that on a water cracker with some crunchy unsweetened peanut butter and bits of good-quality bacon? Would that work? Does it still satisfy the rules? Is it likely to be palatable? I am by no means a talented cook or food expert of any kind. These are just meandering thoughts from an ignorant, but intrigued, commenter. Tue, Mar 27, 2012 : 12:08 a.m.
Mon, Mar 26, 2012 : 3:34 p.m. This sounds revolting. I'm getting the dry heaves just looking at the picture. Sat, Apr 14, 2012 : 5:29 a.m. Negative feedback is just as valid. You're not trying to teach manners. You're trying to control the views expressed. If a recipe appears revolting, then people have every right to express that view. It's unfortunate that you view that as an insult. And by the way, when Rabbi Israel Salanter said, &quot;Not everything that's thought should be said,&quot; he made no exclusion of recipes. Just because that recipe occurred to you does not mean you did well by AnnArbor.com or yourself by publishing it. Sun, Apr 1, 2012 : 11:06 p.m.
Sun, Apr 1, 2012 : 10:50 p.m. So just to make sure I understand your rules.... 1. Someone who finds it disgusting is obligated to suggest that others might like it. But those who find it attractive are not required to suggest others might find it revolting. 2. If someone finds it disgusting they should just not comment, and yet those who might like it are free to comment. 3. And people who are not using their real names are allowed to comment positively but not comment negatively? Enough of your double standards. Again, &quot;it's disgusting&quot; is just as valid an opinion as &quot;it's delicious&quot; and just as validly expressed. Please get over it. There's no need to keep playing the victim card. Tue, Mar 27, 2012 : 11:21 p.m.
Tue, Mar 27, 2012 : 7:49 p.m.
@Mary: So it's OK to say it looks delicious, but to say it looks disgusting (or revolting) crosses some line? Negative reactions are just as valid as positive reactions. Further, I don't think you or any staff member or any community contributor has any place trying to police comments that do not violate AnnArbor.com's commenting guidelines. If AnnArbor.com doesn't have any community contributor guidelines, they should adopt some. Tue, Mar 27, 2012 : 12:03 a.m. I will repeat what I said to BGS: I see no need to be insulting. I don't understand the mindset of people who are willfully unkind to perfect strangers simply because they don't like the notion of something as simple as a sandwich. Just don't make this, then; why be so antagonistic? Mon, Mar 26, 2012 : 2:36 p.m. This reminds me of a time (perhaps mid 90s) when I took an opposite approach to PB&amp;J. I sliced strawberries in half and carefully inserted a peanut into the depression of each half, and then placed the strawberry/peanut pairs on a slice of bread, followed by another slice of bread on top. With great anticipation, I took my first bite. It was not very good. But it was fun to play with the notion, wasn't it? To try something new? That's part of the joy of this - getting an idea, trying it out, having some fun, not just eating the same ol' thing all the time. Sure, not every recipe works out. But when it does, it's fabulous! Mon, Mar 26, 2012 : 2:01 p.m.
Mon, Mar 26, 2012 : 1:27 p.m.
You obviously have never been near Sachertorte. This is the most disgusting recipe I have ever seen. Gross. After consumption take 1 cholesterol lowering medication. Tue, Mar 27, 2012 : 12:09 a.m.